April 15, 2019 4:51 pm. Godolphin has nominated Flit (right) for the Group One Champagne Stakes at Randwick. The Godolphin operation has a perfect record in this season’s Group One races for juveniles and will rely on Flit to keep the run going in the Champagne Stakes. 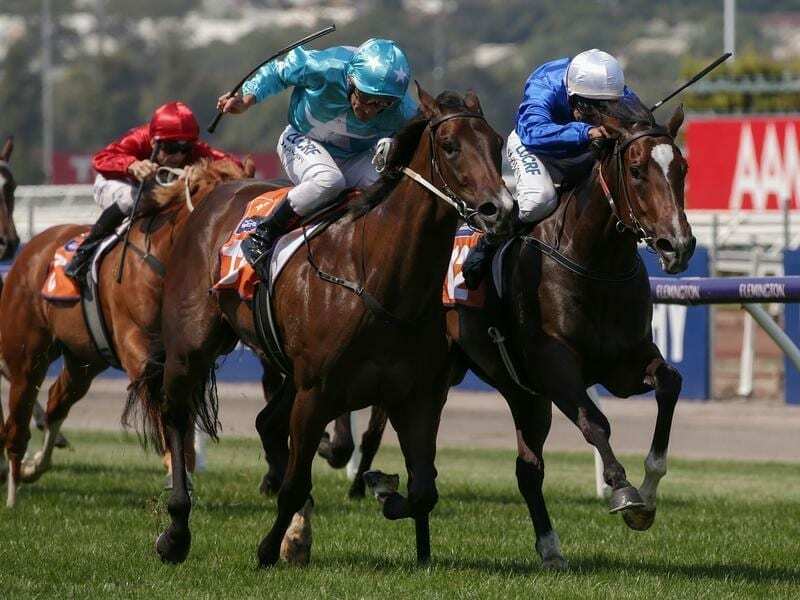 Godolphin-owned two-year-olds have won the Blue Diamond Stakes (Lyre), Golden Slipper (Kiamichi) and ATC Sires’ Produce Stakes (Microphone) this season, with Saturday’s Champagne Stakes (1600m) at Randwick the fourth of five juvenile Group One races for 2018/19. Godolphin’s head trainer in Australia, James Cummings, has nominated Flit for Saturday’s Champagne, with the filly the only Godolphin-owned horse in the entries. Flit dead-heated for first in a Group Three race over 1200m at Flemington earlier this campaign and finished strongly for a close second to Anaheed in the Percy Sykes Stakes (1200m) at Randwick on Saturday. She will have to step up from 1200m to 1600m if she backs up a week later. Flit is among 18 nominations for the Champagne which also include Sires’ Produce Stakes placegetters Loving Gaby and Castelvecchio who head the early market at $2.75 and $3.50, respectively. Flit is next at $6. Godolphin’s Anthony Freedman-trained Chenier was high up in early Champagne Stakes markets but has not been nominated with connections instead expected to send the promising colt to the paddock with a view to the spring. Chenier, a stablemate to Blue Diamond winner Lyre, was an impressive winner at Sandown on debut last month before finishing second as a short-priced favourite at the same course on a soft track last Wednesday. “He’s not really a two-year-old,” Freedman said. “I thought he was OK the other day. That track didn’t really work out for him. He’s a big striding horse and I think he struggled in that soft ground. The Danny O’Brien-trained Lady Lupino, who beat Chenier at Sandown last week, has been entered for the Champagne. Lady Lupino is a half-sister to Star Witness whose two Group One wins included the 2010 Blue Diamond Stakes. James McDonald will ride Loving Gaby as the jockey looks to add to his four Group One wins already during this year’s Sydney autumn carnival which included his Australian Oaks win on Verry Elleegant on Saturday.